Lurking Rhythmically: MLP D&D: the Equestria Campaign - Ponies. Pistols. Prepping. And now, the thrilling conclusion of our series! I have demonstrated that the "mane six" ponies constitute a functional PC group -- Wizard, Bard, Rogue, Ranger, Druid and Barbarian. While each have individual strengths and specialties, there is enough of an ability overlap that the loss of a single member does not mean defeat of the entire group. But what of the world they inhabit? 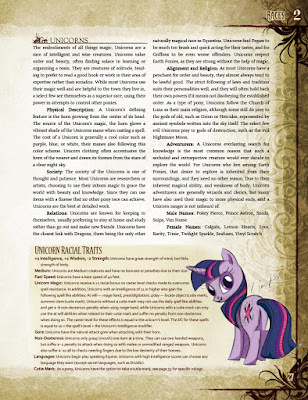 How would a GM run a My Little Pony campaign using D&D or Pathfinder rules? And just what are the stats for the different pony races, anyway? Relax, I've got this under control. Although, they are a bit too serious in places. Rules for using weapons? Really? While there are (as yet) no rules for Cutie Marks in Ponyfinder, a hasty houserule could be cobbled together thusly: When using skills or powers in line with their Cutie Marks, Ponyfinder PCs may always take 10, even in combat or when stressed. If they choose to roll, any 20 is considered a Critical Success with spectacular, magical results (such as a sonic rainboom). Yes, I just invented the Cutie Mark Critical. A horn is made of keratin as are hooves, thus as magic is focused through an alicorn to perform Unicorn magic, a small form of magic must also transfer though Earth Pony hooves. This being the tactile telekinesis that allows they and all MLP to manipulate delicate things with seemingly blunted hooves. 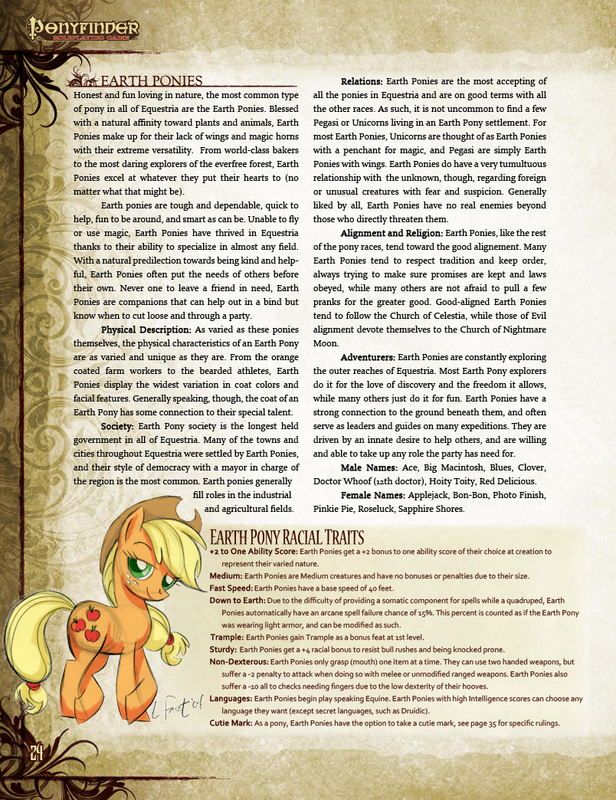 With further study an Earth Pony might find an ability to focus magic through their hooves. Though I think the alicorns natural focusing shape makes the use of arcane powers, more potent and directed through unicorn means. 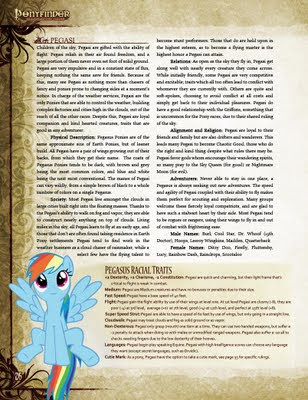 The thing to keep in mind about MLP D&D is that, if you want to be true to the spirit of the cartoon, you need to realize there is a distinct difference between conflict and combat. Out of the 26 episodes of the first season, only a quarter of those had any sort of physical altercation at all, and in only one episode did that actually advance the plot. In fact, rushing headlong into battle actually makes things worse in the series! Now I realize that a lot of gamers are looking at this and rolling their eyes. "No combat?" I hear you scoff. "What is the point?" The point is that My Little Pony is cartoon for children, and you want to play MLP D&D, you're doing one of two things: you're introducing a small child to role-playing, or you're a hard-core brony and want to role-play in Equestria. Either way, you must observe the genre conventions. 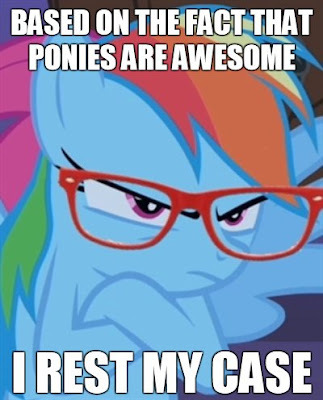 You don't out-fight your opponents in MLP. To steal a phrase from the reality TV series Survivor, you outwit, outplay, or outlast your opponents. Maybe, sometimes, a fight is necessary, but that really should be the path of last resort. If it truly bothers you, reverse one of Carl von Clausewitz' famous sayings and you get "Diplomacy is simply war by other means." Find a plot you like, combine it with one (or more!) 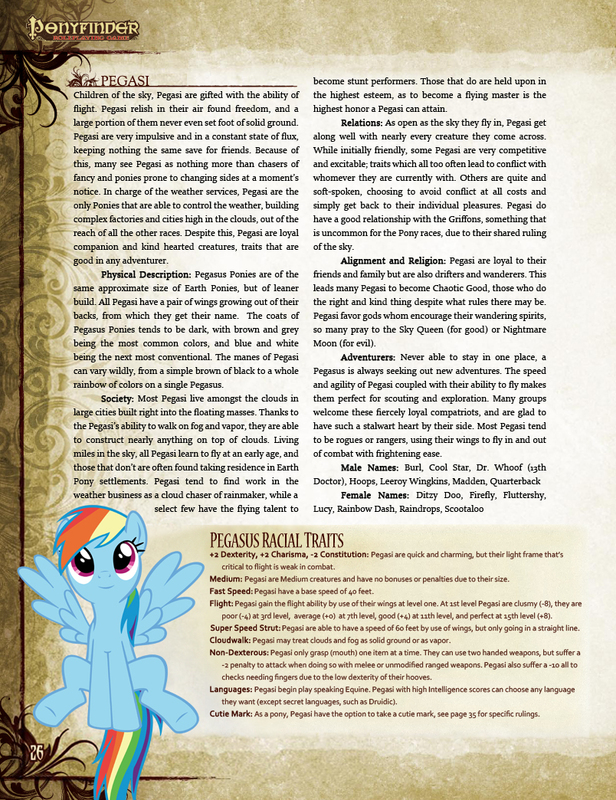 of the basic conflicts, and et voila, you have an MLP D&D adventure ready to go. There's a reason I mentioned the episode Dragonshy in every singly MLP D&D character writeup, because not only is it a great episode, but it's classic D&D: a quest to defeat a dragon, complete with overland perils. You will note that the dragon was not defeated by force of arms -- in fact, that only made it angry. 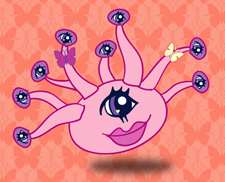 Likewise the Manticore in Elements of Harmony, the Parasprites in Swarm of the Century or the Hydra in Feeling Pinkie Keen. Remember, when in doubt, Love and Tolerate the heck out of them. Princess Celestia must make the sun rise each day, or there is no dawn. Pegasus ponies are in charge of making the weather. All ponies are responsible for making the seasons change (see Fall Weather Friends and Winter Wrap-Up). The ponies are scared to enter the Everfree forest, where plants and animals function without pony intervention. 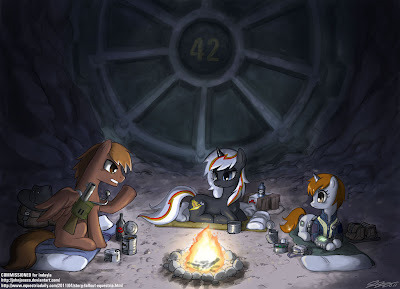 Is Equestria a world on the brink of ecological collapse that needs constant attention? Or is it an alien planet that is the result of thousands of years of magical terraforming by its inhabitants? Or is it both, and -- much like like the world of Thundarr the Barbarian -- a strange new world, built upon the ashes of the old (and perhaps the bones of humanity), containing a mixture of science and technology? 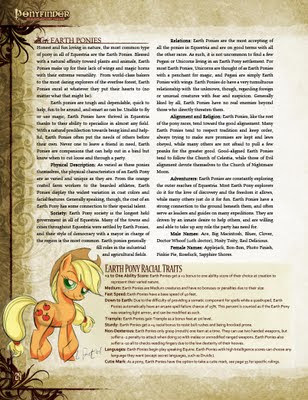 Equestria: half Dark Sun, half Gamma World. If that doesn't get your gamer juices flowing there's something wrong with you. Is there a little girl in your life who you'd like to introduce to role-playing? Odds are excellent that she's already a fan of My Little Pony: Friendship is Magic (and if she's not, by all means, introduce her to the series!). All children have a natural affinity for make-believe, and rolling funny dice in bright colors can be fun. Make it an educational experience: you can teach her math, probability, and problem-solving, As she grows up she will want more sophisticated challenges and you can move on to other, more complicated games. Remember: children are the future of gaming. Don't let them succumb to the instant gratification of MMO's and video games. Teach them the joy of tabletop gaming as they unleash their imaginations. Minor correction. The ponies are only scared of the bizareness of the Everfree Forest at first. Later on they more or less get over it. After all, in Stare Master, Twilight Sparkle told Fluttershy she was going to Zecora to get some tea like it was no big deal. Granted, she promptly got turned into stone by a cockatrice, but that doesn't change the fact Twilight, at least, isn't too freaked out by the Everfree Forest. Your Pathfinder book exercpts are awesome. You made one critical mistake in your post, here. 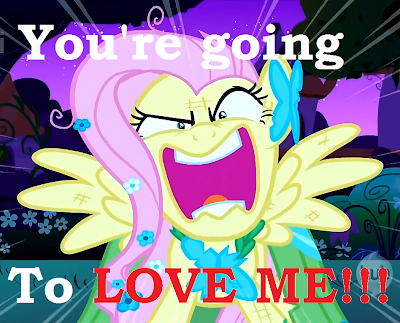 That was to assume that the majority of your male readers would not already be fans of MLP:FIM. In fact, the average adult male gamer is probably more likely to know and adore the show than the average five year old girl. Of course, you forget that Twilight had already bested Nightmare Moon, vanquished an Ursa Minor, and faced down a dragon before this point. It's to be expected that she'd be a little more confident about entering a creepy forest she's already been in... twice? Three times? More? This is so cute! I love it. I have to make a correction, though. 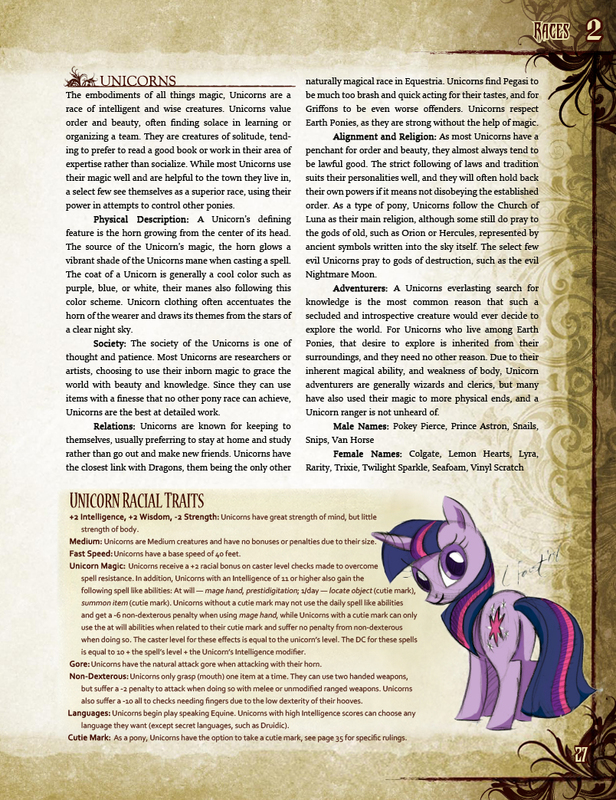 The religion sections of all three don't make sense with each other, and while Celestia is looked upon as a demigod I don't think ponies ever actively worship her in any organized way, I think she would object to that in any case. Also? The whole unicorn racial abilities don't really fit. The only thing all unicorns have shown to be able to do is levitate objects at will at very close range, using levitation as a substitute for having hands, and I think it should be treated as such, an unlimited levitation spell for small objects only and only at very close range. Other "At Will" X times a day spells could be chosen based on one's cutie mark and added as they level up. Makes much more sense with the world of Equestria and would still be fairly balanced, I think.